This morning I’m sitting on the couch, looking like a Buddha in yoga pants and a maternity t-shirt, humbly contemplating the blessings of true friendship that I have. Friends from back home in Texas who, even four years after I abandoned them to the storms and mosquitoes, still regularly keep in touch and send gifts to my boys. Friends from all over the Internet, some of whom I’ve never met, who care for my family and are helping welcome our new son. I have one friend who sends me morning text messages checking up on me when she somehow just knows it’s going to be a rough morning. I have another who sends me silly Facebook messages and keeps me laughing. And I have this friend who, even though she juggles four kids, a yard full of dogs, a household and her own successful, busy blog, still took an entire Sunday out of her schedule to shop for and prep a freezer full of meals for my family and me. Superwoman here, she’s working on running 500 miles this year. She’s mastered a gluten-free lifestyle for herself and her family. Her birthday parties are epic. And she can turn a cart full of groceries into nearly a month’s worth of meals in one afternoon. Yesterday after a tasty brunch we hit up a few stores for supplies. Greta was kind enough to refrain from making fun of me as I huffed and puffed and grunted my way down the aisles. I had chosen eight or nine different casserole recipes that used groups of similar ingredients and spent about $150 on food and pans – not bad for a dozen dinners (that will yield plenty of leftovers)! 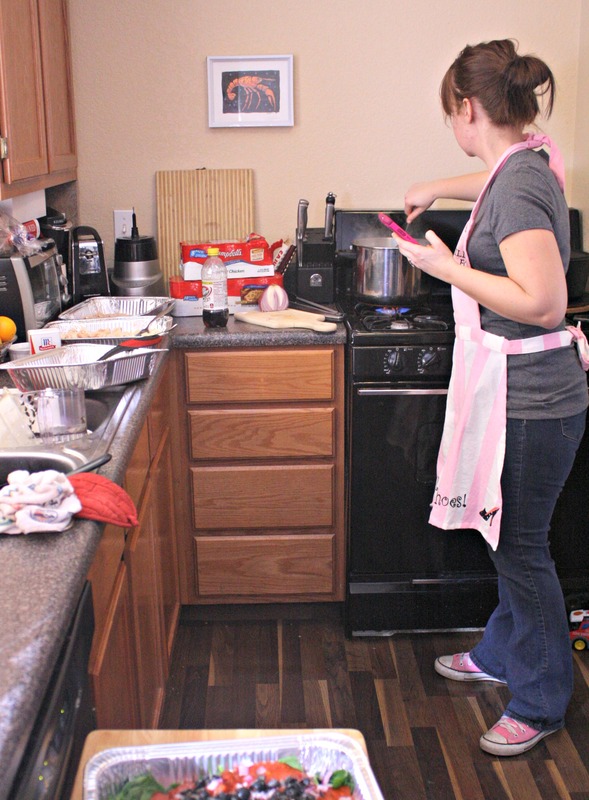 When we got to the house, Greta roasted the chicken, browned the ground meat and boiled the pasta, all while looking cute in her coordinated pink apron/shoes/phone combo. I sat in a chair at the table, ate chocolate and whined about my pelvis. Over a period of about three hours, we assembled a variety of baked chicken pasta dishes, a couple of Mexican-inspired tortilla bakes, and one very badass macaroni and cheese. There’s some greek chicken pasta in there, some pizza pasta, an enchilada casserole that I’m using all of my willpower to avoid cooking RIGHT NOW and a tater tot casserole that will be my guilty pleasure one day. My kitchen was a glorious wreck through much of the process, although it cleaned up right quick when we finished. Looking back, the whole experience was an absolute blast and I look forward to being able pay it forward and do this for another mom one day. In the meantime, I plan to make “Freezer Cooking Day” a new tradition around here. If you’re interested in giving freezer cooking a try, you just need about an hour on the Internet, some good organizational skills, a great friend to help out and one afternoon a month. I hope to show off some of these meals on Fridays after the baby is born – you know, once I can form coherent sentences again. 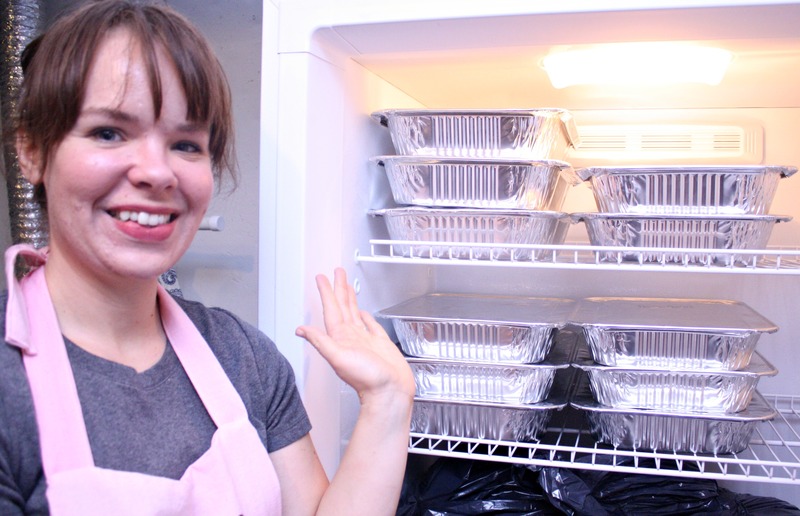 In the meantime, check out a few resources if you’d like to get started on your own freezer stash! We cooked ALL THE FOODS. Whatever, TAKE THE CREDIT. 🙂 It was a lot of fun, and I was in bed before nine. You wore me out. I promise, no casserole shall be eaten before its time. Hang in there, Julie, you almost made it! It feels really great to have all those meals just sitting there. I cannot BELIEVE I never did this before. 🙂 Also, Kerstin, seriously, I may be pregnant forever. Just saying. I freakin’ wish she would come visit me. I’m not pregnant nor in need of anyone to take care of me I just want food. And those dishes looked awesome. Kudos to her. Haha, Cydney, when you and Matt do get around to procreating, I will come fill your freezer, mkay? I will hold you to that for years to come. I’ll be in college for like 12 years so be prepared to baby me if I get pregnant in Grad School. This is awesome! Can you share any of the recipes? Did you pin them? I’m so excited for you to have this baby. Glad you are doing ok. And plz feel free to send Greta over to my house, says the girl who can’t cook. This is just so awesome. I’m so happy you two have each other in your lives ( and slightly jealous, too). Your mutual love for each other just shines through! Julie, here’s to hoping you get to hold your bundle of joy very soon. Good luck! What an awesome thing to do! I may have another baby just to have Greta come cook for me. What an awesome friend! And what a great way to spend time together too. We all need a Greta in our lives. Love your friendship with each other. Truly. I need to do this so badly! Days like today when I have no idea what to eat… this would be nice! I’m so glad you two have each other.